According to yoga philosophy, warrior 2 (Virabhadrasana II) pose is named after a fierce warrior—an incarnation of Shiva—described as having a thousand heads, a thousand eyes and a thousand feet; wielding a thousand clubs and wearing a tiger’s skin. You don’t have to maintain this appearance, though, to enjoy the benefits of this incredibly strengthening yoga pose. Simply get out your mat, be sure that you are somewhat warmed up, and be ready for a challenge. At first glance, warrior 2 poses looks fairly simple. It is, however, deceiving. Warrior 2 asks that you breathe through the eventual discomfort that can set in from bending the front knee so deeply while standing tall in your upper body. Eventually as well, the arms can fatigue, making you want to drop them and give in to being tired. But…are you a warrior? While it certainly is okay to take a break and stop as you practice yoga, there is what I call “the edge.” Find your edge in each pose. Know when you truly need to stop, take a breath and try again…but also know when you have a little bit more fire left in you to hold the pose, dance on the edge, and ultimately create a new level of strength. We want sensation in yoga—not pain. This, fellow yogis, is finding your edge. 1. Start by standing in mountain pose (tadasana) at the top of your yoga mat. Bring your hands to your heart center and take a moment to breathe deeply. 2. Take a big step out with your left foot so that you are in a wide stance. Then, bring your hands to your hips. Turn just the right foot to face to front of your mat. Keep the hips nice and level, and on an inhalation, bend deeply, as if to make a right angle, into your right knee. Be sure you keep your right knee aligned over the second and third toes. 3. Extend both arms wide so that they make a “T” shape. Calm your shoulders, and gaze softly beyond your right middle finger. Be mindful that you aren’t reaching too far forward through the right arm. We say in yoga that we don’t want to “reach into the future” or “hang out in the past” (therefore leaning too far back through the left arm), but rather we want to stay right in the present, with the shoulders squared right over the hips. Even though the front knee is deeply bent, stay strong in the back leg. Try not to collapse it into the front leg. 4. Hold for 10 breaths, then try on the other side. Once you are here, now the work begins. There is a tendency to clutch and grip the mat with your toes. This is simply tension creeping in. Instead of this, lift all ten toes off your mat—even that stubborn little pinky toe. As you lift the toes, imagine you could use the ball mound of the front foot to energetically, isometrically “push” your yoga mat forward. You will feel the shin bone work forward, and possibly the thigh of that front leg contract, which firms the muscle to the bone. This action makes your legs not only strong, but takes tension off tired legs. As for your back leg, as mentioned, you will need to keep it strong. Imagine your femur bones (thigh bones) spreading far apart, so you can widen into your sacral spine. Engage your belly into your spine, so that your core is active and strong. This action also protects your low back. 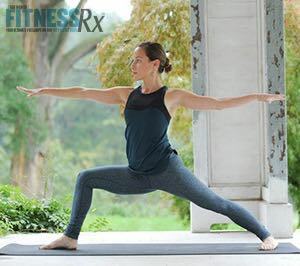 As well, as you hold the pose, your shoulders might want to tense up. Can you relax them? Warrior 2 also acts as a hip opener. With regard to the thigh of the bent front leg, imagine you could rotate your thigh clockwise. This action externally rotates the thigh, which in turn helps the front hip to open. Naturally, when you perform the other side, the opposite hip (which might be tighter!) also gets a chance to open. If you are someone who sits or drives a lot, you will surely feel this work! Don’t worry if at first you can only hold the pose for a few breaths. With continued practice, you will develop the strength and stamina to stay here for a bit longer. Yoga invites us to block out the “I can’t!” and instead focus on “Yes, I can.” Once you start to see what is possible on your yoga mat, it can inspire amazing changes off your mat, in your every day life.